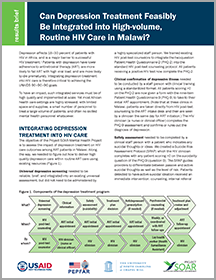 Project SOAR is assessing the impact of depression treatment on HIV care outcomes among antiretroviral (ART) patients in Malawi. But in order to do this we first had to figure out how to deliver high quality depression care using existing resources. This results brief describes how SOAR integrated depression screening and management into busy ART clinics, how well providers are carrying out the various program components, and how patients are responding to treatment.